The OPM1-BL Includes a bandpass filter for monitoring the irradiance from blue light sources between 370 and 515 nm. Readout is in Watts/cm2. The ILTOPM1 Series of optical process monitors are designed for on-line monitoring of optical intensities in real-time applications. 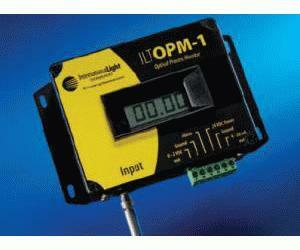 The instruments are available in remote detector (ILTOPM1-D) or fiber coupled versions (ILTOPM1-F). The fiber-coupled version is configured with an internally mounted filter and detector allowing the optical pick-up to be placed in harsh or sensitive environments. Input light is directed onto the fiber surface at the end of the stainless-steel armored cable, and conducted to the remotely-mounted sender. The sender has a built-in read-out as well as the electrical interface for 4-20 mA operation. The remote fiber pick-up can be mounted using the provided SMA 905 adapter flange. The ILTOPM1 can be customized with detector filtration from many spectral ranges including UV, UVA, UVB, VIS, Blue, UV-NIR. The ILTOPM1 allows the user to visually check irradiance levels displayed on the 4 1/2 digit LCD while at the same time transferring data using the 4 - 20 mA current loop output interface through connection to standard programmable logic controllers (PLCs).